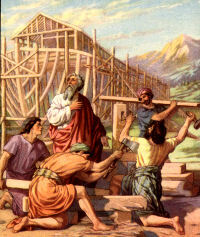 When Noah finally left the Ark and settled on dry land, he built an altar to worship the Lord who had saved him. God placed a rainbow in the sky as token of his resolve to never visit such a disaster over the face of the earth again. Noah was a savior, preserving the natural life of all within the Ark; Christ bring supernatural life to mankind and preserves that life within His Mystical Body, the Church.